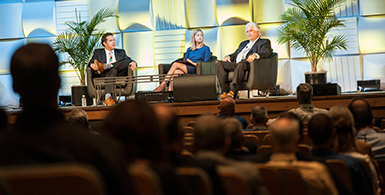 The On-Site Energy Conference & Expo will take place April 11-13, 2016, at the Charlotte Convention Center in Charlotte, North Carolina. Co-located with the International Biomass Conference & Expo, this event will bring together commercial, institutional and industrial energy professionals who are evaluating or already managing on-site power and thermal energy technologies. This three-day event will offer industry-leading content and networking opportunities for those engaged in on-site energy asset installation, operations and maintenance. Find out how utilities and independent power producers manage and deploy distributed energy. Learn how energy managers spearhead their organizations’ on-site energy projects. Discover how and why companies, campuses and municipalities are developing microgrids. Gather ideas about connecting, harmonizing and protecting hybrid energy assets. Find out how new and creative financing solutions are making on-site energy more attractive. Learn how commercial and institutional energy managers rely on, and benefit from, third-party O&M. Attendees will include energy managers, facility managers, physical plant administrators, consulting-specifying engineers, sustainability practitioners, building and business owners, power generation equipment manufacturers, distributors and others. Many conference participants are responsible for the on-site energy needs of campuses and schools, commercial buildings, hotels, data centers, industrial facilities, military bases, microgrids, large-scale events and mission critical facilities worldwide. Attendees will be able to maximizing their interaction with industry colleagues by taking advantage of multiple networking opportunities at the event over the course of three days. Organized by BBI International and produced by On-Site Energy Management magazine, this new event is being held in conjunction with the largest biomass industry gathering in the world. The International Biomass Conference & Expo is expected to draw more than 1,200 attendees and 220 exhibitors within a 200,000-square-foot expo. By attending the On-Site Energy Conference & Expo, you will be participating in a larger, related industry gathering. The two events will share an expo and a general session, as well as refreshment breaks and receptions. Access to both conferences is granted with a single registration.